The villagers found the huge reptile with a swollen belly few meters away from the garden where her family found a few of her belongings earlier in the day. They later killed the snake and sliced open the belly to find the woman’s body intact. The locals spotted the huge snake with a swollen belly and suspected the woman must have been swallowed by it. 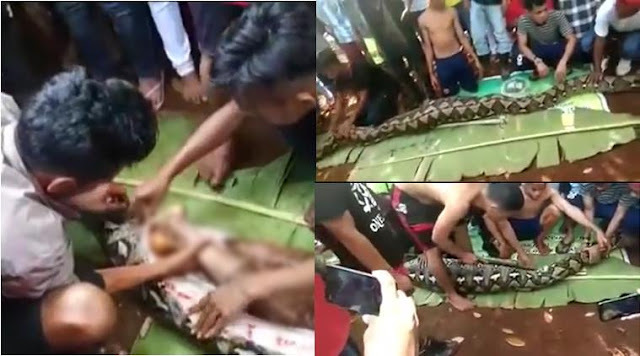 An Indonesian woman who went missing while checking her vegetable garden has been found inside a 23-foot-long python’s stomach. The victim, 54-year-old Wa Tiba from Muna Island in central Indonesia, went missing last week. The locals launched a search operation to trace her. According to The Jakarta Post, after two days of searching, the villagers found a huge reptile with a swollen belly a few meters away from a garden where Tiba’s family found a few of her belongings.